I live a pretty normal, quiet life. I'm not complaining nor am I envious of the limelight: in fact, I am just the type to avoid it. I love my normalcy. I love the quiet. I am the guy in the back of the theater with all eyes pointed up front. I don't fear losing a step or a bit of my luster. I don't dread fading away. I never asked to shine in the first place. For some, though, the spotlight is everything. They thrive when they sparkle surrounded by a world that can be so dark and dull. They don't want to stay grounded. They want to fly as close to the sun as possible without burning up. Sometimes I wonder what that must be like, to fly too close. To stand in front of an audience only to end up in the back of the room. To get high off the lights and the looks and the noise only to eventually be cut off and feel so low. Sitting in silence, just wanting to feel it all again. Norma Desmond loved it. She lived for the glow of the light shining upon her as the whole world watched. All of that is over now though. The past. Now she just wanders around her mansion, living in exile. Watching her own films and dreaming of those days. Dreaming of a return to glory. 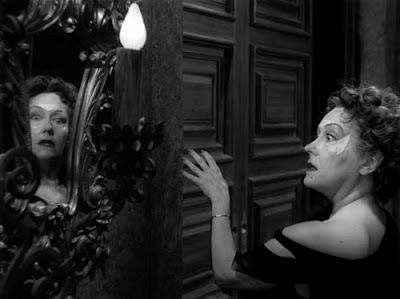 Sunset Boulevard is a film about Norma Desmond, played with a brilliant intensity by Gloria Swanson. She had a perfect grasp on just how theatrical and desperate and delusional the character should be. 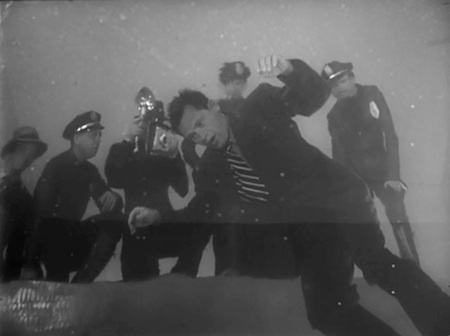 It's also a film about Joe Gillis (William Holden), a writer who is much younger than Norma yet he not only finds himself wrapped up in her world, he literally feels trapped inside it. Joe was a man in need of work and Norma had exactly that to offer, the chance to fix a screenplay she had written that isn't exactly up to par. We already know things don't turn out well for Joe. We spend the entire film waiting for tragedy, but that knowledge doesn't ruin the journey to get there at all. It doesn't haunt over every scene. It's too easy to get distracted by the show that is Norma Desmond, to be mesmerized by a performance from Swanson that comes ever so close to tipping over the edge of silly, more of a parody of such a fallen Hollywood star but she never does. Just when I thought about laughing at her theatrics I was brought right back down to earth by a look, a movement or the way she delivered the dialogue. While inside her mansion she is searching for the spotlight, the irony is that she absolutely owns it as a character in Sunset Boulevard. I couldn't take my eyes off of her. Every since I first started to learn about and explore cinema, I have had an immense appreciation for noir at it's finest. Sunset Boulevard is a perfect example of this, with the legendary filmmaker Billy Wilder delivering a picture that has not only stayed relevant during the 65 years since its release, it essentially is the exact opposite of the character Norma Desmond. 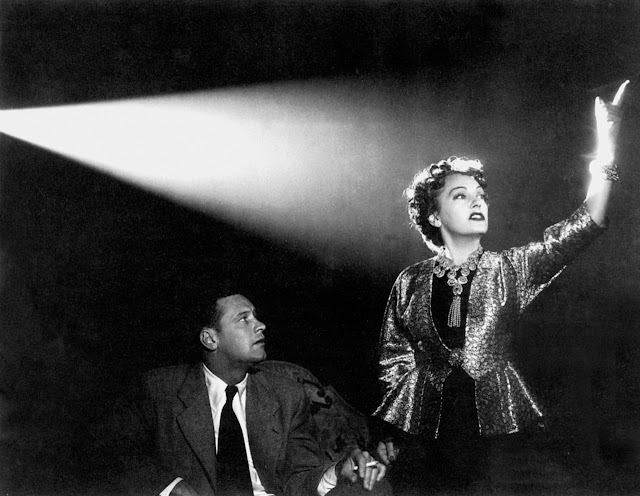 Sunset Boulevard initially soared, with critics falling in love early and often and 11 Oscar nominations to recognize the greatness of the film. It never crashed back down though, as it still today is considered one of the finest achievements in the history of the medium. I don't know where it ranks for me personally, but it is a movie that feels flawless. I watched it over a week ago but I took my time writing this review because I wanted the experience to soak in to see how it would resonate. I can't stop thinking about Sunset Boulevard. It is a masterpiece. I never wanted to fly high enough to feel the burn of the inevitable fall from grace. I never wanted the stage of the spotlight. I will gladly watch and study characters like Norma Desmond instead. This is one of those ones I really like to rewatch and you can't get enough, I mean come on there are so many quotable line in this movie, but I think my favorite parts will always be the beginning "He always wanted a pool" and the ending "I'm ready for my close up Mr DeMille"
I can absolutely see myself revisiting this one a few times Cody, for sure. It is so quotable and your two favorite lines are representative of just how perfect this movie is. Thanks for checking out the review, appreciate it!